Yadier Molina, all-star catcher for the 2013 National League pennant winners, became the first Cardinals player in 67 years to appear in four World Series for St. Louis. 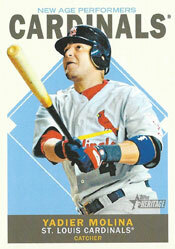 Molina played for St. Louis in the 2004, 2006, 2011 and 2013 World Series. He backed up Mike Matheny in the 2004 World Series and excelled as an everyday player in the other three World Series. In 21 World Series games, Molina has a batting average of .328 (22-for-67) with 12 RBI. He hit .412 (7-for-17) in the 2006 World Series versus the Tigers and .333 (8-for-24) with nine RBI in the 2011 World Series against the Rangers. Until Molina, the last Cardinals to play in four World Series for St. Louis were Whitey Kurowski, Marty Marion and Stan Musial. Each played in the World Series of 1942, 1943, 1944 and 1946. _ Jim Bottomley, 1926, 1928, 1930, 1931 World Series: The Hall of Fame first baseman, a career .310 hitter, batted .200 (18-for-90) in 24 World Series games for St. Louis. He was spectacular in the 1926 World Series against the Yankees, hitting .345 (10-for-29). He was 8-for-61 in the three World Series after that, including 1-for-22 with nine strikeouts in the 1930 matchup against the Athletics. _ Chick Hafey, 1926, 1928, 1930, 1931 World Series: Like Bottomley, this Hall of Fame outfielder mostly was a World Series flop with St. Louis. A career .317 hitter, he batted .205 (18-for-88) with two RBI and 19 strikeouts in 23 World Series games for the Cardinals. Hafey did produce five doubles in six games in the 1930 World Series. _ Jesse Haines, 1926, 1928, 1930, 1934 World Series: The Hall of Fame pitcher was 3-1 with a 1.67 ERA in six World Series games (four starts) for St. Louis. In 1926, he won Game 3 with a five-hit shutout of the Yankees and he started and won the epic Game 7 in which Grover Cleveland Alexander earned the save. He also recorded a complete-game win against Lefty Grove and the Athletics in Game 4 in 1930. Haines was 41 when he appeared in relief for St. Louis in Game 4 of the 1934 World Series versus the Tigers. _ Bill Hallahan, 1926, 1930, 1931, 1934 World Series: The left-hander was 3-1 with a 1.36 ERA in seven World Series games (five starts) for the Cardinals. In 1931, Hallahan earned two wins and a save against the Athletics. He had an 0.49 ERA, yielding one run in 18.1 innings. Hallahan pitched a three-hit shutout in Game 2, won Game 5 with another complete game and got the save in Game 7 when he relieved starter Burleigh Grimes with two outs and two on in the ninth and retired Max Bishop on a fly out to center. _ Flint Rhem, 1926, 1928, 1930, 1931 World Series: The right-hander was 0-1 with a 6.10 ERA in four World Series games (two starts) for St. Louis. In Game 4 of the 1926 World Series, Babe Ruth hit two home runs off Rhem. _ Frankie Frisch, 1928, 1930, 1931, 1934 World Series: The Hall of Fame second baseman was player-manager of the 1934 champions. In Game 7 that year, Frisch broke open a scoreless game in the third inning with a three-run double off Tigers starter Elden Auker, sparking St. Louis to an 11-0 victory. _ Ernie Orsatti, 1928, 1930, 1931, 1934 World Series: The outfielder, who spent his entire nine-year big-league career with the Cardinals, hit .273 in 13 World Series games for St. Louis. Orsatti, the starting center fielder in 1934, hit .318 (7-for-22) with three walks in that year’s World Series. _ Whitey Kurowski, 1942, 1943, 1944, 1946 World Series: In 1946, the third baseman tied with Enos Slaughter for the Cardinals World Series lead in hits, with eight. In 23 World Series games for St. Louis, Kurowski hit .253 with nine RBI. _ Marty Marion, 1942, 1943, 1944, 1946 World Series: The shortstop hit just one home run during the 1943 regular season, but he belted a homer against Tiny Bonham in Game 2 of the 1943 World Series at Yankee Stadium. Marion hit .357 (5-for-14) in that Series. In 23 World Series games for St. Louis, Marion hit .231. _ Stan Musial, 1942, 1943, 1944, 1946 World Series: The Hall of Fame outfielder’s best World Series performance was in 1944 when he batted .304 (7-for-23) versus the Browns. Musial hit his lone career World Series home run that year against Sig Jakucki in Game 4. In 23 World Series games, The Man batted .256 with 12 walks and eight RBI.